After three decades, Night Flight is something of a pop culture fever dream, a sensory rush of synthesizer melodies, solarized video, and severe haircuts. Surely there was never a time when The Residents, Nam June Paik, Ozzy Osbourne, Mr. Bill, Duke Ellington, and German New Wave cinema could all share a TV time slot, let alone jostle one another in rapid-fire, attention-jarring montage? Revisiting the show today, those distant, neon-hazy memories aren’t too far off: Night Flight’s influential eclecticism really was as wide-ranging and deceptively random as a child of the ’80s might recall. Given free rein over USA Network’s late-night airwaves every Friday and Saturday, the show scavenged the era’s underground culture to Frankenstein together eight hours of defiantly offbeat programming, a concept that today feels both of its time and surprisingly prescient. Night Flight foreshadows the internet’s aggregator culture in the way that it ping-pongs from one fascination to the next, showing intense focus on a single item for a few minutes before being distracted by another. The show might bliss out on a feedback-squalling performance from Neil Young’s Rust Never Sleeps for 20 minutes, smash cut to a re-voiced black-and-white film clip for two, then settle down for a politically focused discussion with Wendy O. Williams for 10. Experiencing the show in 2016 isn’t far removed from a time-sucking couple of hours spent spiraling through YouTube or Facebook. Each cut or click leads to a fresh distraction, sometimes closely related, often a complete departure. The difference, though, is in how one navigates the proverbial rabbit hole. If social media can be an endless free fall as curiouser and curiouser sights whiz by, hardly registering, Night Flight is more of a guided tour, with a knowledgeable scout leading the way through its labyrinthine tunnels. Since its advent, the internet has been hailed for eliminating the gatekeepers, allowing direct communication between content creators and audiences minus the mediating hand of record companies, movie studios, or network execs. That’s undeniably one of its great accomplishments, but in leveling the field it also creates an impenetrable clutter. That’s the great promise of the modern streaming service: by constantly monitoring every song that traverses your earbuds or show that you binge-watch, Spotify or Apple Music or Netflix or Hulu can dig up another couple dozen songs or films that you might like. There’s a difference, though, between telling you what you might like and what you should like. The latter is the terrain of the music or film or whatever snob. The former lends itself to algorithms. But algorithms aren’t weird. Cultural obsessives are; they can be elitist or condescending, sure, but they can also make bizarre leaps that aren’t immediately obvious but lead to remarkable, brain-warping discoveries. Where gatekeepers might block you out, there were always tastemakers to sneak you in the side door and show you around: The older sibling who returns from college with a stack of weird new records and movie recommendations; the sarcastic record store clerk who recognizes the seeds of decent taste in your weekly purchases; the cool neighborhood kid whose every arcane utterance sends you scrambling to Google in an attempt to decipher their references. Night Flight was nothing if not weird, and seemed tailor-made for discovery. It might lure you in with the promise of a Ghostbusters giveaway, but in the meantime you were left to puzzle through The Residents’ One-Minute Movies or a few out-of-context minutes from a psychedelic Japanese monster battle. The word “curation” gets overused these days, but it’s an apt description of the way Night Flight was assembled. As wild a hodgepodge as its offerings could be over the course of any given night, each music video, short film, or interview segment—and perhaps more importantly, the juxtapositions between them—reflected the tastes and interests of a small team of producers led by two men with far-ranging tastes: creator and producer Stuart S. Shapiro, a film producer and distributor who’d found success on the midnight movie circuit, and programming director Stuart Samuels, a professor of history at the University Of Pennsylvania who specialized in pop culture and penned the book Midnight Movies. The beginnings of Night Flight in 1981 coincided, within a few months, with the launch of MTV. Both were heavily focused on the burgeoning medium of the music video, but with diametrically opposed approaches. MTV was modeled on radio, with glib, innocuously pretty hosts introducing the hits of the day in heavy rotation. The network’s ultimate influence—which persists long after the last “Why don’t they play videos anymore?” lament faded into silence—was to shift the way pop music was consumed, inextricably marrying sound to spectacle. Image was key to Night Flight as well, but where its competitor was a teen-pleasing radio station for the eyes, Night Flight was a virtual art gallery, a hip downtown hangout where punk bands play amidst abstract imagery. Shapiro had a particular interest in video art, and the way that a short experimental film by Paik or the Brothers Quay might sit alongside a video by Culture Club or David Bowie unavoidably leads the viewer to think about their use of imagery and cinematic technique. 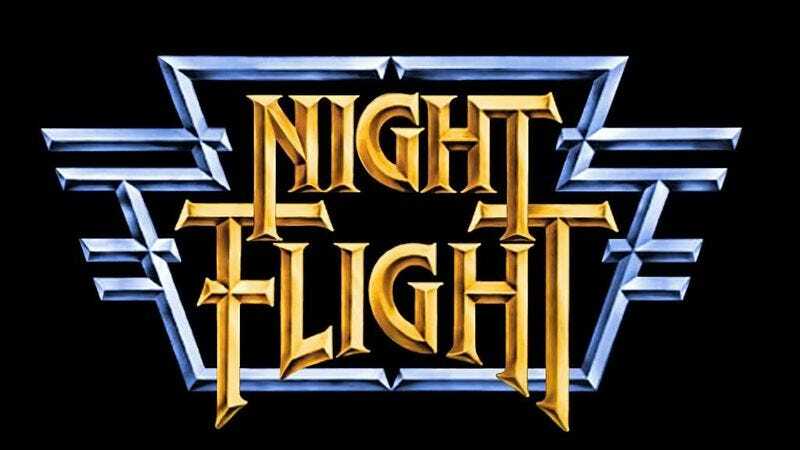 Night Flight credited directors long before MTV ever thought to mention their names onscreen, and the show’s coverage of the then-contemporary music scene foregoes the gossip for a more analytical approach. Night Flight itself has now entered the digital fray in the form of Night Flight PLUS, a new streaming service that offers full episodes from the original USA Network masters. It’s now a time capsule rather than a fringe-dwelling experiment, but looking back on the show is more than a nostalgia trip. It offers a peek at a cultural moment contemplating itself—a limited glimpse, necessarily, but a fascinating one, still able to surprise and reveal in ways that, say, watching an old episode of 120 Minutes or Headbangers Ball can’t. It remains to be seen if the playlists and channels offered up by some of the modern streaming services will go out on the same kind of limb. Most playlists that pop up on streaming services tend to hew closely to a single artist, genre, or theme rather than more conceptual groupings or left-field pairings. They seem to run on the same fallacy that rules Hollywood’s focus-grouped timidity: Namely, thinking that audiences want more of the same thing rather than more of the same experience, experiences that include novelty and surprise. Apple Music seems to be on the right path with its guest curators, an approach that could lead fans of an open-eared artist or label to discover odd influences or out-there discoveries. YouTube would seem an ideal platform for the kind of cross-media connections that Night Flight used to make, so that a channel in the right hands could offer similarly logic-defying associations. The challenge to having the same kind of impact today is that Night Flight was a dictatorship, however benevolent, and the whole point of user-oriented sites and services like these are their democratizing effect. Night Flight arrived at a crucial time, as cable TV was still in its infancy but rapidly expanding. USA had been going off the air overnight, so why not hand over the airwaves to a group of midnight-movie experts who knew what audiences responded to in the wee hours? Its time slot became a key aspect of its appeal in a way that’s impossible in today’s “everything, all the time” environment. It was something you stumbled on as you were fading to sleep, or as you came home from a night of imbibing—altered states that made viewers especially susceptible to its heady charms. Night Flight arrives on Roku boxes and Apple TV at a similar moment, this time not breaking ground but offering a model for those new services to emulate. With online competition now being essentially the totality of recorded art, it’s hard to imagine a single channel or curator being able to have the kind of impact that Night Flight did for its generation. It would be nice to see an occasional move away from the hyper-specific and toward the culturally omnivorous, though. While it’s great to have the entire history of pro wrestling or classic cinema or even an ’80s basic cable anomaly available at the touch of a button, it’s valuable to have the option of switching on the unexpected as well.